32 examiners participate in the COSI workshop in Georgia. The number of obese schoolchildren and adolescents is continuing to rise in many countries across the WHO European Region, and Georgia is no exception. The recent STEPwise approach to surveillance (STEPS) survey on the main risk factors for noncommunicable diseases in Georgia revealed that in 2016 more than 65% of adults were overweight or obese; an increase from 2010, when 56% of adults were overweight or obese. As the foundations of obesity are often laid in early childhood, addressing the rise in adult obesity requires interventions early in life. In an effort to tackle the obesity epidemic, Georgia recently joined the WHO European Childhood Obesity Surveillance Initiative (COSI) and will start a study to establish the prevalence of overweight and obesity among 7-year-old children in October 2017. This will survey a nationally representative sample of 3500 children from 242 schools around the country. The study will help to raise understanding of the status of the epidemic in this population and inform policy action to reverse the trend. On 27–29 September 2017 WHO organized a COSI workshop for the team of 32 examiners who will be involved in implementation of the COSI survey in Georgia. 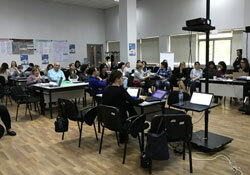 The workshop took place at the National Centre for Disease Control and Public Health in Tbilisi, Georgia, which was identified as the institute responsible for overall national coordination and management of the Initiative. During training participants learned the protocol and methodology of the COSI survey and practised taking anthropometric measurements of primary schoolchildren and recording data. All examiners successfully completed the workshop and were assigned individual codes for the upcoming data collection.